Google has just debuted the latest entry to its fleet of Labs products, introducing the search giant to the travel space. Dubbed City Tours, the new site can build itineraries for brief trips to locations around the globe in a matter of seconds. At this point details on the new product are fairly sparse — it looks like Google hasn’t written its customary blog post yet, but given how basic the product is it’s pretty easy to figure out how it works. Getting started is incredibly easy — just type in where you’re visiting (say, San Francisco or London), and Google will present a suggested itinerary spanning a three day trip, with around a dozen attractions per day depending on the city. From there you can change the number of days you’ll be staying (Google will show more attractions the longer you stay), and you can also manually adjust the list of places you’d like to visit. You can add a new attraction by entering its name in a text field, and Google will try to find it in its database. All attractions include a star rating, along with its hours operation and location. For the most part adding attractions works pretty well (which is going to be key given that you can’t expect Google to predict everything you’ll want to see). It managed to find the London Eye perfectly, and it even figured out that Platform 9¾ was located at the King’s Cross Rail Station. 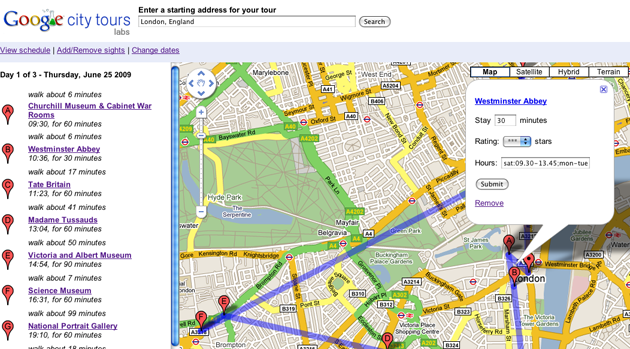 That said, it isn’t perfect: a search for Hyde Park directed me to a nearby hostel, which I suppose would have gotten me there but probably isn’t the ideal result. Perhaps the coolest part of the new product is the way it uses Google Maps to figure out which locations are closest to each other. Rather than simply present a list of places Google thinks you might want to check out, the site will logically order them according to where they’re located, minimizing the travel time between each. Given its status as a Labs product this shouldn’t come as much of a surprise, but there are still a few kinks in City Tours. For one, I am apparently unable to remove events from my suggested itinerary (I’ve tried in both Firefox and Safari with the same issue). Likewise, sometimes when I click on the name of a location nothing happens. And it badly needs support for Google Transit, which can automatically route you across town using public transportiation — my London tour included a 99 minute walk that would have only been a couple minutes away had I ridden on the Tube. In the mean time, there are plenty of other travel sites that offer similar (and in many cases, more robust) functionality than Google’s City Tours, including TC50 finalist GoPlanit, Offbeat Guides, and Zicasso.